Through the summer, gathering my evening meal from the plethora of plums, gaggles of grapes, bountiful beans, and tons of tomatoes, I knew I was eating the most tasty, healthful food from my 5,000 square foot city lot. Even as the weather changed, I snipped chives, gathered thyme, and harvested rosemary, as additions to roasts, stews, and salads. Each night at the dinner table, I would announce, “The beans, basil, and tomatoes are from our garden.” My kids would respond, “Oh, Mom, do you have to tell us where the food is from?” in that teenage whine. Of course I want them to know, because I want to expand my joy and add community and neighborliness beyond my dinner table. Incorporating a sense of shared purpose, not in an “invitation-only” environment, would be ideal. In four short years, there will be only two diners at my table. Preparing and enjoying a meal together is one of the greatest pleasures in life. As I age, and am no longer able or willing to garden or spend as much time in the kitchen, I want that just-picked fresh prepared food experience at my table. Granted, I can schlep to the farmers market or purchase a Community Supported Agriculture (CSA) box, but to live among neighbors and have great food surrounding me, would be my idyllic setting. I don’t want to be destined to grocery store only choices. Heyday Farm is on historical island farm property that had been fallow, but its owners wanted to create a sustainable farm business and hired a farm manager to facilitate creation of their vision. Craig Skipton, a trained landscape architect with a penchant for being his own boss is the farmer and visionmaker creating, developing, and growing the farm brand that permeates the island. 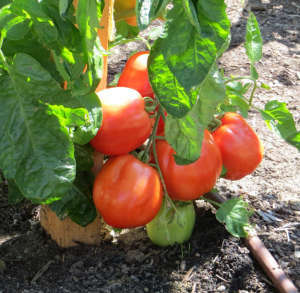 Vegetables are cultivated in raised beds and greenhouses. Cattle is kept on the main farm for meat and cheese production. Chickens flourish in moveable hoop houses on an adjacent property. 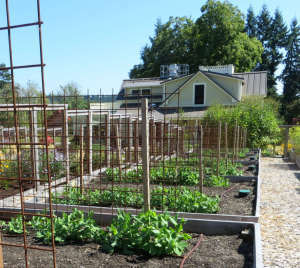 The main property is the showcase, with the classic farmhouse, where guests can stay overnight, enjoy a farm-fresh dinner or take a class on how to use fresh produce in cooking or canning. Further, the commercial kitchen is canning central where pickles, krauts, and chutneys are produced for sale in local markets. Having a GROW Community concept right next door to Heyday Farm would meld two innovative concepts and create a community where couples, families, and singles would thrive. The Ten One Planet Principles provide design approaches to allow communities to reduce their ecological footprint by applying zero carbon and waste concepts, using sustainable building materials, reducing transportation infrastructure, minimizing impacts to land use and wildlife, incorporating local, sustainably grown food, and creating a community that integrates health, happiness, and well-being into the development. 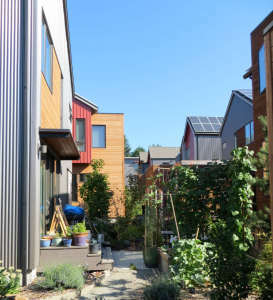 GROW has included the One Planet features by integrating on-site community owned and maintained garden spaces between the homes, parking areas separated from the living spaces, small lot sizes, energy-efficient homes, and the added bonus of affordable solar powered electricity. Inside the homes are compact, but light and roomy with strategically placed amenities that offer comfort, space, and easy livability. Many units have a separate, detached room with toilet facilities, that could be used by visiting grandparents, an independent teenager or an office. Since garages are non-existent, each single-family unit is equipped with a discreetly, designed structure for bikes, garden supplies, and other outdoor based storage. Cars are on the southern end of the community in a standards asphalt lot, but placed strategically such at the full-southern exposure is available for solar. 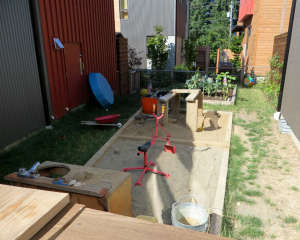 Occupants at GROW are families with children, empty-nesters or singles. It is a true mélange of people with differing life stages, occupations, and backgrounds, that all want to be part of true community, while maintaining an independent, but neighborly home life. I applaud your efforts in suitability and growing local gardens, these are exciting projects that will help educate and help our communities. Look forward to hearing more on this developing process.